Questioner: I wonder what you really mean by ending thought. I talked to a friend about it and he said it is some kind of oriental nonsense. To him thought is the highest form of intelligence and action, the very salt of life, indispensable. It has created civilization, and all relationship is based on it. All of us accept this, from the greatest thinker to the humblest labourer. When we don’t think we sleep, vegetate or daydream; we are vacant, dull and unproductive, whereas when we are awake we are thinking, doing, living, quarrelling: these are the only two states we know. You say, be beyond both – beyond thought and vacant inactivity. What do you mean by this? Krishnamurti: Very simply put, thought is the response of memory, the past. The past is an infinity or a second ago. When thought acts it is this past which is acting as memory, as experience, as knowledge, as opportunity. All will is desire based on this past and directed towards pleasure or the avoidance of pain. When thought is functioning it is the past, therefore there is no new living at all; it is the past living in the present, modifying itself and the present. So there is nothing new in life that way, and when something new is to be found there must be the absence of the past, the mind must not be cluttered up with thought, fear, pleasure, and everything else. Only when the mind is uncluttered can the new come into being, and for this reason we say that thought must be still, operating only when it has to – objectively, efficiently. All continuity is thought; when there is continuity there is nothing new. Do you see how important this is? It’s really a question of life itself. Either you live in the past, or you live totally differently: that is the whole point. Questioner: I think I do see what you mean, but how in the world is one to end this thought? When I listen to the blackbird there is thought telling me instantly it is the blackbird; when I walk down the street thought tells me I am walking down the street and tells me all I recognise and see; when I play with the notion of not thinking it is again thought that plays this game. All meaning and understanding and communication are thought. Even when I am not communicating with someone else I am doing so with myself. When I am awake, I think, when I am asleep I think. The whole structure of my being is thought. Its roots lie far deeper than I know. All I think and do and all I am is thought, thought creating pleasure and pain, appetites, longings, resolutions, conclusions, hopes, fears and questions. Thought commits murder and thought forgives. So how can one go beyond it? Isn’t it thought again which seeks to go beyond it? 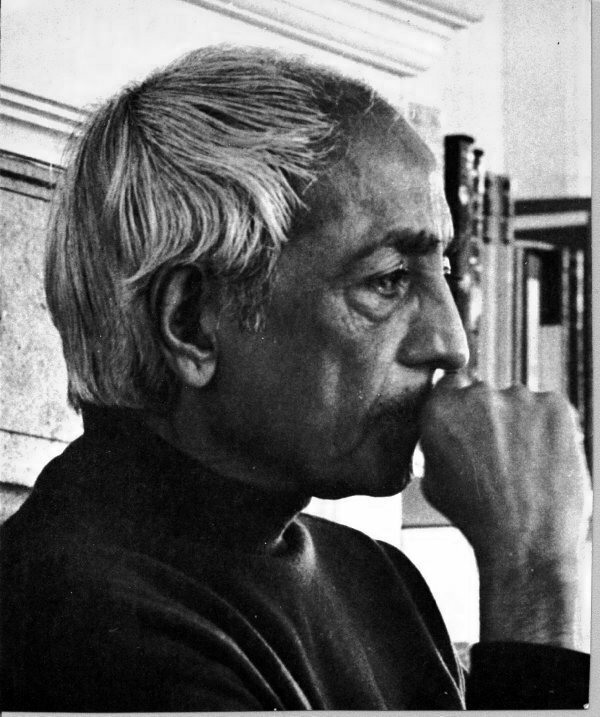 Krishnamurti: Is it? You assume that it is thought, but is it, actually? Questioner: It is a mental movement with meaning, a communication to oneself. Krishnamurti: The meaning of the word and the understanding of that meaning is thought. That is necessary in life. There thought must function efficiently. It is a technological matter. But you are not asking that. You are asking how thought, which is the very movement of life as you know it, can come to an end. Can it only end when you die? That is really your question, isn’t it? Krishnamurti: The brain is the source of thought. The brain is matter and thought is matter. Can the brain – with all its reactions and its immediate responses to every challenge and demand – can that brain be very still? It is not a question of ending thought, but of whether the brain can be completely still. Can it act with full capacity when necessary and otherwise be still? This stillness is not physical death. See what happens when the brain is completely still. See what happens. Questioner: In that space there was a blackbird, the green tree, the blue sky, the man hammering next door, the sound of the wind in the trees and my own heartbeat, the total quietness of the body. That is all. I do try to do this, perhaps I should just give up trying.